Located at an altitude of 6,543m, Shivling is a two summit mountain that lies not far away from the snout of the Gangotri Glacier, in the northern Indian state of Uttrakhand. It is one of the stunning peaks of the Garhwal region. 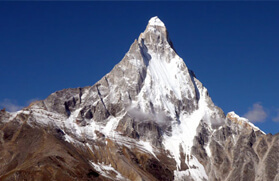 Shivling is also known as 'Indian Matterhorn' because of its unusual shape. 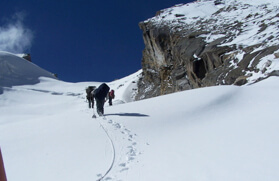 Shivling trek is one of the famous treks among the climbers. After the discovery of the Gangotri Glacier in 1933 by one of the British traveller, a German traveller, R. Schwarzengruber climbed many mountains close to the Gangotri Glacier and did an exploration of Shivling in 1938. Since his first climb, around ten other routes have been found to climb to Shivling. 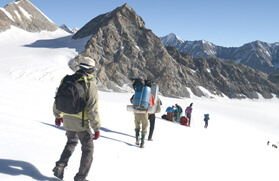 At Trekking in India, we offer an exclusive Shivling Trekking Tour for all those who love adventure. 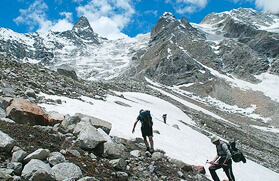 During this trek, you will get a chance to discover the Tapovan meadow that lies between Gaumukh and Shivling. Tapovan is a famous pilgrimage site as it offers many exciting views of the mountain. You can find Himalayan goat also known as Ibex here. Also, if you are lucky enough, then you can even get a chance to see a rare seen snow leopard. 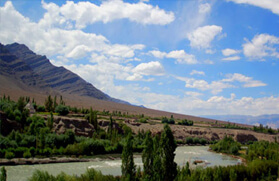 This trek will even take you to Nandanvan, which is located at a height of 4340m. 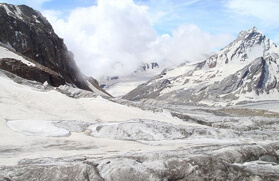 You will cross through many glaciers like Meru glacier and Kirti Bamak glacier. 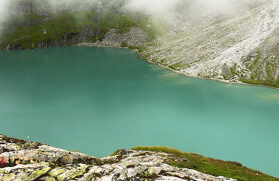 Also, you will trek to Vasuki Tal, a beautiful base for Mt Satopanth and Mt Vasuki Parbat with a small lake. 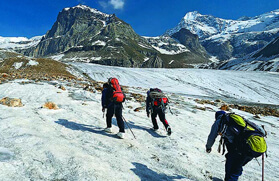 From Vasuki Tal the experienced trekker can reach towards Badrinath after crossing the several glaciers and one of the major high pass named Kalindi Khal. 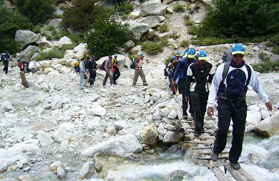 The trek to Shivling is rated as moderate to challenging. The best time for planning an adventure holiday to Shivling trek is between May to June and Sept to Oct. Our Shivling Trekking Tour is best for adventure lovers. After breakfast full Day Delhi sightseeing. Visit Red Fort, Gandhi Memorial, India Gate, President House, Qutab Minar etc. Overnight stay at hotel. In the morning drive to Mussoorie via Dehradun. Mussoorie is 295 kms from Delhi and it will take 6-7 hrs. Upon arrival at Mussoorie transfer to hotel for dinner and overnight stay. In the morning after breakfast drive to Uttarkashi via Chamba. 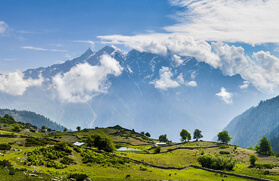 One can see a panoramic view of the high mountain peaks of Garhwal. Upon arrival at Uttarkashi check in to hotel. Evening free to explore the surroundings. Dinner and overnight stay at the hotel. In the morning drive to Gangotri via a beautiful Harsil valley. Enroute take a holy dip in hot sulphur springs at Gangnani. Upon arrival at Gangotri check in to hotel. Evening free to explore the beautiful surroundings. Dinner and overnight stay in hotel/TRH. The Day is for relax, acclimatization and explore the place for pilgrimage. Dinner and overnight stay at hotel/TRH. The walk begins with gradual ascent through pine trees, alongside the roaring Bhagirathi River with towering cliffs on your left hand side. Soon after you leave Gangotri, you pass a check post for the Gangotri Conservation Project. The money they collect from your guide trees and an awareness campaign for trekkers on eco-sensitive tourism. ToDay's walk is quite short to help with acclimatisation. Chirbasa means pine trees. Here you have superb views of Hanuman Tibba (17,186 ft/5366m), Bhrigu Parbat (19,217 ft/6000m), Bhagirathi I, II and III (21,958 ft/6856m, 20,857 ft/6512m, and 20,671 ft/6454m respectively). You could well spot herds of Bharal roaming the hillside above Chirbasa. Dinner and overnight stay in tents at Bhojbassa. Early in the Morning enjoy the panoramic view of Bhagirathi group of peaks. After breakfast trek to Gomukh (3890mt), the source of the Ganges. 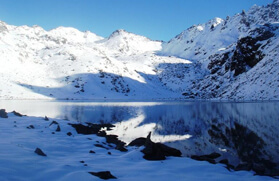 Gomukh is where the water of Ganga trickles down from the glaciers. The sages called it 'Gomukh', because in the distant past, it probably appeared like a cow's mouth. Explore the area and trek to Tapovan, one of the finest high altitude alpine meadows in the area. The trek from Gomukh to Tapovan is ascent steep, and as we climb, the view of the surrounding peaks becomes clearer. The appear to be just a stone's throw away. Tapovan known for its beautiful meadows that encircle the base camp of the Shivling peak, Tapovan is a very pleasant surprised spot with a large meadow complete with bubbling streams, wildflowers and campsites. Herds of Bharal (blue mountain goats) is a common sight from here on mountain ridges. On the far side of the glacier the Bhagarithi I, II, III (6454mt), provide an equally impressive backdrop. It is also the little wonder where Sadhus and saints choose this spot for extended meditation during the long summer month. Arrive Tapovan and camp. Dinner and overnight stay in camp. Early in the morning a full Day trek to Kirti Bamak glacier. From here you can see the Kedardome peak (6850 mts/22468 ft), Kirti Bamak (6500 mts/21320 ft) and a magnificent view of Shivling from the east. After exploring the area return to Tapovan for dinner and overnight stay. The Day is also thrilling to see the Mt. Meru peak (6400 m). In the morning trek to the base of Mt. Meru crossing the meadows of Tapovan the trail climbs into another ablation valley. It's mythical name is "The mountain of Gold". After exploring the area return back to Tapovan for dinner and overnight stay. We trace back to Nandanvan via Gomukh glacier. The route from Tapovan leads from the upper section of the meadow till down and onto the glacier. From Gomukh turn towards Nandanvan (4340m) and steering on right one will be on top of the Gangotri glacier. The glacier runs between two ranges and the landslides make a layer of rocky moraine on the ice which makes the walking easier. The glacier walk is very slippery and a slight lack of concentration would be dangerous. Huge crevasses gaped here and there. After a walking for about a kilometer there is a vertical ascent. Big rocks enroute offer grips and foot - holds but many of them are deceptive too. Overnight stay in tents. Morning trek along with Chaturangi Glacier to reach Vasukital, a beautiful base for Mt Satopanth and Mt Vasuki Parbat with a small lake. The trek is steady upward. After exploring the area trek back to Nandanvan for dinner and overnight stay. Morning after breakfast drive 170 kms to reach Haridwar. Arrival at Haridwar by afternoon. Explore the surrounding and evening transfer to railway station to catch train for Delhi. Arrival at Delhi by night and then transfer to hotel for overnight stay. Half Day city tour and evening transfer to airport to catch your onwards destination.